3D imaging in the interventional lab. Interventional procedures are becoming increasingly complex. With new techniques and devices being introduced almost weekly, 2D fluoroscopic techniques alone are not always adequate to the task of facilitating interventional procedures. Especially in areas where vasculature is tortuous and complex, 3D imaging is an essential asset for effective intervention. 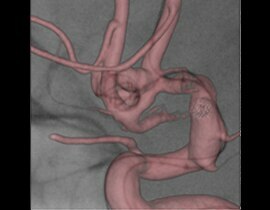 Innova 3D is an acquisition mode that provides 3D imaging from rotational angiography allowing you to clearly visualize complex vasculature in the interventional lab. Displays axial, sagittal, coronal, and oblique cross-sections. Customizable, automatic, full resolution volume reconstruction and display on the monitor. Provides 3D reconstruction from a single 200° (approximate) spin acquired at 30 fps. Performed at 40°/s, a rotation yields approximately 150 images over a 5 second span. 3D reconstruction begins immediately and automatically, using your preferred parameters, as soon as acquired images are received on the AW Workstation. Offers a range of filters and resolution modes for your 3D models. Standard models are reconstructed at 5123 resolution, and "Fast 5123" (2x time reduction) and 2563 (8x time reduction) modes are available when time is an issue. Volume Viewer's range of analysis tools facilitates your evaluation of 3D vessel and interventional device models. Innova 3D is a software option which reconstructs 3D volumes from Rotational Fluoroscopy acquisition to assist the physician in diagnosis, surgical planning, interventional procedures and treatment follow-up.